The week before the period begins can be a difficult one emotionally for many women. Different types of mood changes, as well as a range of physical symptoms can occur. There have been difficulties for many years in finding the hormonal alterations which lead to premenstrual emotional symptoms. However, the study of neuroendocrinology has uncovered information which indicates that hormones can very much affect our moods. Premenstrual Syndrome (PMS) is defined as a collection of physical, psychological, and emotional symptoms which occur only during the luteal phase of the menstrual cycle and are of sufficient severity to interfere with some aspects of life. Premenstrual Dysphoric Disorder (PMDD) has a similar cyclical timing to PMS, but mood symptoms predominate and are severe. PMDD often interferes with the sufferer’s ability to function in her social or occupational life. The main symptoms are intense irritability, anxiety, and depression. Although it may contain some of the physical symptoms of PMS (such as bloating, cravings, fatigue, headaches) the symptoms are primarily related to mood. In both cases, symptoms resolve shortly after the onset of the menstrual period. We have long known that the pituitary gland, the “master gland” is controlled by the hypothalamus in the brain. We now know that hormones produced by the glands such as the ovaries, testes, and adrenal (such as estrogen, progesterone, and testosterone) have effects on brain chemistry through different molecular mechanisms. Hormones can affect the levels of neurotransmitters in the brain. In addition to this, there are special hormones known as neuroactive steroids which are synthesized in the brain or central nervous system from other hormones. These hormones powerfully and rapidly cause changes in brain function. Mood symptoms of PMS and PMDD develop due to the shift in hormone levels related to ovulation. It is well known that serotonin levels influence the mood, and estrogens have been found to increase serotonergic activity by increasing serotonergic receptors, transport and uptake. Estrogen decreases after ovulation and then again at the end of the cycle just prior to the period and this is very likely to be one of the triggering causes of PMS and PMDD mood changes. 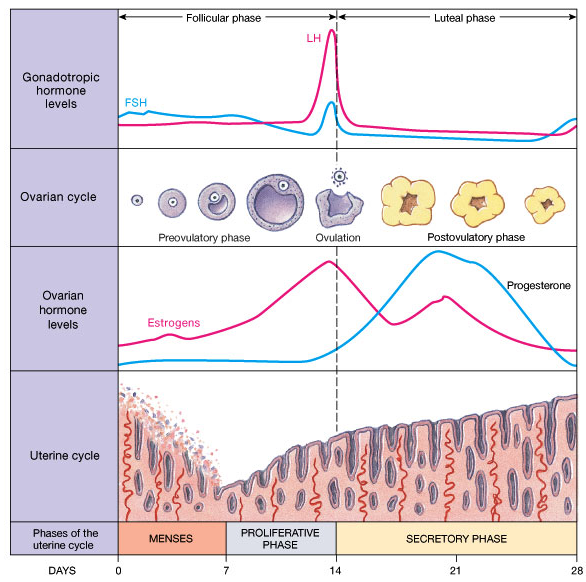 Several studies had initially shown no correlation between total progesterone and mood changes of PMS, however knowing that a large shift in progesterone correlates with the stage in the luteal phase when symptoms begin has led to more investigation in this area. In the brain, ovary and adrenals, progesterone is converted to a neurosteroid called allopregnanolone, also known as tetrahydroprogesterone. This hormone has been discovered to exert profound effects on mood and mental function. A 2001 study found a relationship between low levels of allopregnanolone and severe symptoms of PMS and PMDD. Another study found that commonly prescribed antidepressant medications such as fluoxetine (Prozac) may in part work through increasing levels of allopregnenalone in the brain. This specific type of progesterone may be of much interest to those who suffer specifically from premenstrual anxiety. Allopregnanolone enhances the activity of GABA, the chief inhibitory neurotransmitter in the brain and it is through this mechanism that it exerts its effects on reducing anxiety. In those women who have lower allopregnanolone levels, the activity of GABA would be reduced, leading to higher levels of anxiety or higher response to stress at the premenstrual time. Lower levels of allopregnanolone may theoretically be caused by lower activity of the enzymes which create it, 5α reductase and 3α-hydroxysteroidoxidoreductase. This may be partly genetic in onset (the first gene linked to estrogen in PMDD was discovered in 2007, none have yet to be discovered for allopregnanolone but research on this is in its beginnings). In integrative medicine, there are two basic things to consider before deciding on treatment for luteal phase mood disorders. Firstly, are the PMS/PMDD symptoms more akin to anxiety or to depression? In those who exhibit more of a depressive syndrome, estrogen and serotonin are playing more of a role. In patients who experience more anxiety and stress symptoms, it is low levels of progesterone/allopregnanolone which cause symptoms. It is important to consult your physician before starting any treatment, as specific therapies listed below may have interactions or side effects and use requires professional supervision. Considerations for women experiencing more depressive symptoms would be : St John’s wort. This therapy has been studied and shown to have benefit for patients with PMS and PMDD. Another consideration would be 5-HTP, which has not been specifically studied clinically for PMS, but does have promising evidence in the treatment of serotonin mediated depressive symptoms. For patients in the category of anxiety, we must consider that the condition may be arising from either low progesterone, or from poor conversion of progesterone to allopregnanolone. I would suggest salivary profiling to determine if total progesterone levels are low. First line treatment options for women with low overall progesterone could include Vitex agnus castus throughout the cycle and vitamin B6. This would aim to establish healthy corpus luteum function (and thereby increase progesterone) through pituitary regulation. Studies have shown that increasing progesterone levels increases allopregnanolone in the brain. To reduce symptoms of anxiety : passionflower (which binds to benzodiazapene sites) or GABA can be prescribed to help modulate the reduced action of GABA. For many women, this condition is more evident in the late luteal phase where progesterone levels begin to drop, and therefore a targeted anti anxiety protocol can be used for these few days with a focus on the GABA receptors. In severe cases where progesterone is measured to be low through the luteal phase, a carefully titrated cyclic dosage of bio-identical progesterone can be prescribed by a physician. In addition, for both types of PMS/PMDD discussed here, calcium and magnesium are important and effective therapies. Abnormal cellular and serum levels of these minerals have been linked to increased PMS mood symptoms. With therapies targeted to the patient’s individual hormonal picture, PMS and PMDD can be managed for most women, and quality of life can be very much improved. De Berardis et al. Treatment of premenstrual dysphoric disorder (PMDD) with a novel formulation of drospirenone and ethinyl estradiol. Ther Clin Risk Manag. 2007 August; 3(4): 585–590. Halbreich U, Rojansky N, Palter S, et al. Estrogen augments serotonergic activity in postmenopausal women. Biol Psychiatry. 1995;37:434–41. Rapkin et al. Progesterone Metabolite Allopregnanolone in Women With Premenstrual Syndrome. Obstetrics & Gynecology. 90(5):709-714, November 1997.